The Tri-City Building and Construction Trades Council is an association consisting of the affiliated union crafts that represent skilled construction trades members who are involved in all aspects of building and construction in the Western Illinois and Eastern Iowa region. The highly trained and skilled workforce affiliated with the Tri-City Building Trades Council include representatives from the following trades: Boilermakers, Bricklayers & Allied Craftworkers, Carpenters, Electricians, Elevator Constructors, Glaziers, Heat & Frost Insulators, Iron Workers, Millwrights, Operating Engineers, Operative Plasters and Cement Finishers, Painters, Plumbers and Pipefitters, Roofers, Sheet Metal Workers, Steamfitters and Teamsters. All the crafts work together to promote growth and development of the building and construction trade unions in the greater Quad Cities region. The Tri-City Building and Construction Trades Council service area includes the following counties in Eastern Iowa: Scott, Clinton, Muscatine and Cedar and the Western Illinois Counties of Rock Island, Henry, Mercer, Knox, Warren and Henderson. 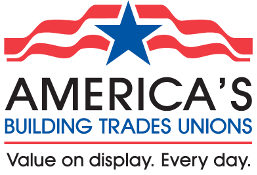 The Building Trades Council helps develop and advance apprenticeship training programs, promote safe work practices, and support fair wage and benefit standards in the construction industry. The Council also participates in community and legislative activities that promote the building and construction trade unions and their members. The Building and Construction Trades Council and its unions represent workers across many diverse sectors of the construction industry. These men and women are not only building new projects and expanding infrastructure they are laying the foundation for our future. For more information on the Tri-City Building Trades, please feel free to contact the office at 309-786-1115. © 2019 Tri-City Building & Construction Trades Council. All Rights Reserved.